A recreation center for Westwood will officially be a part of Denver’s general obligation bond which will be put to voters in November’s municipal election. Westwood is one of the youngest neighborhoods in Denver, with nearly one-third of its residents under the age of 18. Sadly, it also has the highest rate of childhood obesity and the least space for kids to play in Denver. The neighborhood has only one major park, and has only 15 percent of the park space recommended by city authorities. When interviewed, 80 percent of parents in Westwood said they and their children don’t get enough physical activity because there is no safe place to exercise. Through the PASS Project, LiveWell connected Westwood Unidos with the advocacy firm CRL Associates and began forming a strategy. With CRL’s help, Westwood began pitching the plan to Denver City Council and Mayor Hancock. The coalition wanted the Westwood neighborhood plan to include stronger language around the importance of a recreation center in Westwood, which was successfully added to the last draft of the plan. 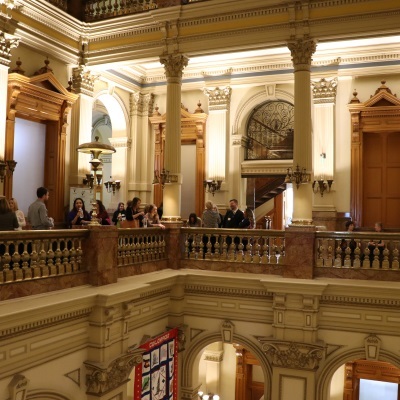 In June of 2016, the plan was submitted to Denver city council, and the neighborhood organized very strong turnout and testimony for the hearing. The plan passed unanimously and nearly every council member spoke up during comments in support of bond dollars for a rec center in the neighborhood. The coalition used this as a jumping board to launch their campaign to get a rec center on the ballot. You can read about the coalition’s success in turning out residents to speak with city officials during the city’s official GO Bond tour here. After the tour, designed to gather as much input from the public as possible, the city set up committees representing parks and rec, transportation, and other stakeholders in the bond process which made official recommendations to the official GO Bond committee on what to include in the final ballot question. This committee will present its recommendations to city council. While details are still being finalized by the committee, the rec center has officially been included in their proposal which is very likely to be approved by city council. You can see the full proposal here. In the month since the legislative session ended and the dust has settled, we do know that the large group of transportation funding advocates that we worked with during the session to try and pass House Bill 17-1242 will not use the initiative process to place a transportation funding measure on the 2017 ballot. As you may recall, the Colorado Contractors Association (CCA) had submitted six transportation funding ballot titles for the 2017 ballot. CCA has since pulled all six and will not move forward to collect signatures and place on the ballot. It is likely that CCA and other partners will use the initiative process to place a transportation funding solution on the November 2018 ballot. We feel strongly that walking, biking and transit will remain as part of the transportation package and we will continue to work with the larger coalition to ensure this is the case. LiveWell recently signed on to a letter supporting the rural development mission of the USDA and opposing demoting the mission to an assistant to the Secretary of Agriculture. As part of the USDA sub-cabinet, Under Secretaries wield significant influence and can easily communicate directly with the Secretary. Establishing a new assistant position in place of an Under Secretary will not improve the administration of Rural Development programs; in fact, it will do just the opposite. The Rural Development Mission Area and its agencies deliver a multitude of programs to rural America, and have many complex decisions to make on a daily basis. This is a job to be handled by a full-fledged Under Secretary along with his or her Deputy Under Secretaries, and their staff, not by a single assistant in the Secretary’s office. Moreover, the new “assistant to the Secretary” would not require vetting and confirmation by the Senate, which we believe is an important step in ensuring that the individual who takes the helm of Rural Development is qualified and able to serve the needs of rural communities across all 50 states. Through grants, loan guarantees, and technical assistance, the Rural Development programs provide $216 billion to support economic development and essential services such as housing, health care, first responder services and equipment, and water, electric and communications infrastructure. These investments are critical to sustaining rural economies and ensuring access to critical services. Roughly 85 percent of all counties experiencing persistent poverty in the United States are in rural areas and rural childhood poverty rates are at their highest point since 1986 with 1 in 4 children in rural communities currently experiencing poverty. The office of rural development provides critical interventions for these communities. We do not believe that removing Rural Development mission area would increase USDA’s ability to serve these communities or that such changes would benefit rural areas. Given the high rates of poverty and low rates of economic growth in rural communities, we strongly support maintaining these critical programs under an Under Secretary and would energetically support any effort to strengthen the Under Secretary’s ability to support rural communities. President Trump spent last week touring the country as part of an initial push to build public support for his yet-to-be-detailed infrastructure plan. The President’s promises to prioritize infrastructure spending were some of his only campaign proposals to enjoy bipartisan support, but passing an infrastructure package may be held up by concerns in both parties for some of Trump’s more controversial plans. Broadly, the President is calling for an initial invest of roughly $1 trillion which would be applied towards improving faltering interstates, bridges, dams, levees, airports and other vital pieces of the national transportation network. While specific projects haven’t been identified by the administration, this broad call remains popular with both the public and members of both parties. However, critics and supporters alike both recognize that a $1 trillion in new spending is a drop in the bucket compared to national infrastructure needs. Colorado alone needs slightly under $1 trillion over the next ten years to keep up with demands on its infrastructure. Complicating matters further is controversial plan put out by the administration to privatize the Federal Aviation Administration. The administration, as well as many Republican and Democratic lawmakers see value in privatizing the agency tasked with maintaining airline safety and efficacy pointing to outdated technologies that the FAA has been slow to replace in relation to other developed countries. Still other Republican and Democratic lawmakers point to the cost of such a transition to the federal government and the competing conflicts of interest such a private enterprise would have, conflicts made all the more complicating by a possible diminishment of federal oversight of the enterprise’s activities. Critics have asked that the provision be temporarily removed from the table, if only to allow for debate on more pressing issues. Despite his public statements of support for these projects, Pres. Trump has not included appropriations for any of these projects in any of his budget requests to Congress. Pres. Trump and the new Secretary of Agriculture Sonnie Perdue have rescinded or stalled Obama-era improvements to the Federal School Lunch Nutrition Program. The May announcement removed the requirement that all prepared food containing grains be at least 51% whole grain-based. The May announcement also stalled new sodium restrictions set to take effect during the 2017-18 school year that would have set the sodium limit at 680 mg per meal (current standards are roughly 1200 mg per meal but vary by age/grade). LiveWell is most concerned, however, that meals can now include 1% flavored and chocolate milk. Flavored milk is calorie dense and contains sugar comparable to other sugar-sweetened beverages like soda and sports drinks. In order for a meal to be reimbursable under the school lunch program, students must take milk. Like many of our partners across the nation, we are deeply disappointed and disturbed by President Trump’s proposed budget. We are particularly alarmed by cuts to the Supplemental Nutrition Assistance Program (SNAP or food stamps) and a call to block grant Medicaid to the states. The President’s budget emphasizes his administration’s goal to move able-bodied adults off government assistance programs and into the workforce. The SNAP program already limits the amount of time beneficiaries can receive SNAP benefits while remaining unemployed, though some counties with struggling economies and high rates of unemployment have received “waivers” for this requirement. Eliminating benefits for these recipients discounts structural barriers preventing them from attaining employment- including high rates of joblessness in many rustbelt towns, reservations, and other regions of the country with struggling economies. The President’s proposal would likely also affect recipients who are not able to join the workforce with a proposal to slash the entire program’s budget by 10 percent by 2020. The USDA estimates that only 14 percent of participants are able to work but do not. We are encouraged by signs from the current Congress to move in a different direction than the President’s proposed cuts. Congress will have the final say in what the federal budget funds and does not fund. We look forward to working with our congressional delegation to maintain or strengthen this critical nutrition assistance program.